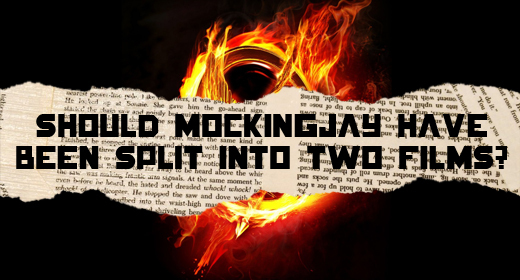 Should Mockingjay Have Been Split Into Two Movies? Are you upset that Mockingjay was split into two movies? Turns out you’re not alone! A wide variety of critics have panned the decision by Lionsgate Studios to divide the adaptation of the final book of The Hunger Games Trilogy into two movies. Much of the criticism has centered around the fact that there just isn’t enough material to support two films. Ever since the final book in the Harry Potter series was divided into two movies, this has become the industry norm with book to film adaptations. I mean, c’mon, did we really need two The Twilight Saga: Breaking Dawn movies? At any rate, we’ll probably continue to see this trend even more as studios try and milk their respective franchises as much as possible. Do you think that final chapter dividing is a blatant money grab? Does it detract from the quality of the film? Let us know below! Have you heard the latest episode of The JustUs Geeks Podcast yet? WHY NOT?!? Listen to it here! 37 years old, married to the most awesome wife ever. Have two kids that are the light of my life. Currently working at Publix. Details on J.K. Rowling’s new novel finally revealed! JuG Interviews: Daniel Ingram of My Little Pony: Friendship is Magic, Littlest Pet Shop, Martha Speaks, and more! It was most definitely inspired by money. If Mockingjay was one film, the opening and overall gross would’ve been far higher than this film’s, however the combined gross of MJP1 and MJP2 will be higher than one film ever would have been. Mockingjay was an excellent book IMO, though it is probably my least favorite of the three. Does it detract from the quality of the overall film? Well it’s tough to fully judge this movie before part II is released, but HAVING SAID THAT, it was a bit of a letdown. The best stuff in the book happens in the second half however so fingers crossed it all comes together. This film though, felt unsure singly a bit padded. I still enjoyed it but Hunger Games 1 was better and Catching Fire was drastically better. I’m okay with it. From the first part it seems like it’s going to deal with coping and resolving the issues from catching fire and the second part will be about going on the offensive and the revolution. Reasonable enough. Part 1 was a snooze fest so I’m good with a second one.